Every kid loves being out on the beach with this family. Those are some of the best memories of his childhood that he will always carry with him. Apart from swimming and building castles, you can look for some new beach activities for kids to make the outing even more fun. Kids love challenge and adventure. Let us take a look at some new ideas for beach activities for kids that your child will love. 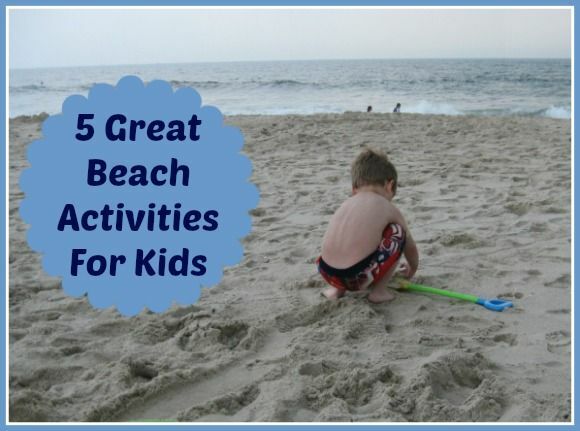 Enjoy these fun beach activities for kids on your next family outing. You kids will simply love all those games that you play with them. Make sure the games suit all age groups, are not complex and are easily understood. If you do make it too hard, your child may lose interest very soon. One fun game is the beach bucket relay race. Fill a bucket with water and have children race against each other (or you!). One child hands off the bucket to the next on his team. The team that has the most water in the bucket at the end wins! Other fun games include volleyball and the limbo. If your child is the creative type, get him a camera and teach him how to take some lovely picture on the beach. This will be a new exciting world for your child and he will simply love the pleasure in simple photography and proud of his talent and collection. Moreover those pictures will always make for special memories. Your child doesn’t need to be a photography pro to take great pictures. The joy is in finding interesting subjects and snapping away! If you’re worried about letting your child use your camera, considering buying him a kid-safe camera, like the Fisher-Price Kid-Tough See Yourself Camera . Explore the beach and collect some sea shells. Ask your child to look carefully and pick up the shells. Teach them that it is made of calcium and is also home to some sea animals like hermit crabs. This will develop a keen interest in your child in nature, showing love and respect for it. When you get home, you can help your child arrange the seashells into fun designs, use them in our memory jar craft or paint them to create special handmade gifts. Let your child understand that a beach is fun and sea is safe for swimming but at the same time some situations can be dangerous too. Apart from playing games, swimming, riding, it is also essential to be safe and feel safe on the beach. Teach them the Flag Warning System with different colors to indicate the level of danger. For instance, when they see a double red flag means, it means they should keep away from the waters. Teach them the meaning about red, yellow, green, purple flags. Let your child carry paper and pencil and ask them to make a map of the beach. He will really love watching the nature around and use his talent to put all that on paper. This will help him understand the beach and its physical features and this scientific beach activity will keep him busy. Enjoy the above beach activities for kids with your family while you are on the beach to create fun new memories that will last a lifetime. Great ideas! We go to the beach a lot and these will come in handy. Thanks Erika! Let me know how your family enjoys the activities! My son still loves playing in the sand and creating, and he is 10! Mitch recently posted..My Son as Nicely, Nicely in Guys & Dolls! With Song! You’re never too old to play in the sand! When my girls were younger I loved taking them to the beach. Burying them in the sand and jumping over the waves was always their favorite part. That’s always so much fun, Tara! Mapping the beach is such a great idea. Never would have thought of it. I remember hunting for sea shells at the beach when I was younger. Its so neat to find all the different shapes and sizes. A tip only take the opened shells or broken shells because the bigger shells are sometimes discarded by one animal that has outgrown it and is needed by a different animal that has outgrown its own smaller shell. We loved searching for sea shells. Family beach vacations create some of the best memories .